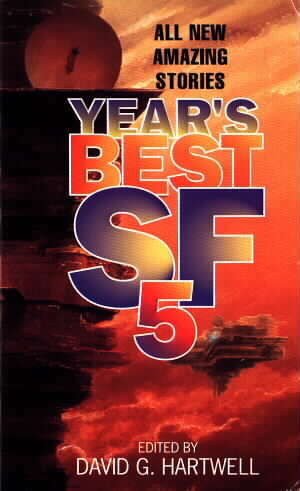 Year's Best SF 5 Edited by David G.Hartwell A book review by jpoc. Beginning in the mid nineties and running at least to the present, David Hartwell produces the alternative "year's best" anthologies. The primary series is of course the similarly titled one edited by Gardner Dozois. In some years the Hartwell selection is at least as good as the generally larger Dozois version. In the fifth year of his endeavours though he missed the mark and this book is not so good. Certainly it is not up to the standards of some of the earlier anthologies. Of course, there are some good stories in here. A competent editor could hardly gather together 25 tales and disappoint with them all but the truth is that less than a dozen of them are better than average for current SF and that hardly counts as "year's best" even if you take into account the fact that there is no overlap with Gardner Dozois' book which presumably gets first choice with the authors. I think that the best story here is Steven Baxter's "Huddle" which tells of a future Earth stricken in an ice age and populated by people genetically engineered to survive the bitterly cold conditions. Perhaps it is a sign of the times but all of the best stories here deal with the alteration of humans in order to deal with the pressures of life in the future. Terry Bisson's "Macs" introduces the ides of creating clones of criminals just so that they may be killed by the families of their victims while Curt Wohleber's "100 Candles" and Tom Purdom's "Fossil Games" are set in futures in which it is normal for people to be extensively altered and those who have no, or few, alterations feel increasingly excluded from their worlds. If you are the kind of fan who just cannot get enough short SF then this is worth getting as you will find some interesting stories but otherwise, you might as well give this a miss and hope for a better effort next year. Malartre, Elizabeth: "Evolution Never Sleeps"
Robinson, Kim Stanley: "Sexual Dimorphism"
Reed, Robert: "Game of the Century"
Bishop, Michael: "Secrets of the Alien Reliquary"
Zettel, Sarah: "Kinds of Strangers"
Doctorow, Cory: "Visit the Sins"
Lawson, Chris "Written in Blood"
Wolfe, Gene: "Has Anybody Seen Junie Moon?" Sawyer, Robert J.: "The Blue Planet"
Aldiss, Brian: "An Apollo Asteroid"
Stableford, Brian M.: "Ashes and Tombstones"
Sussex, Lucy: "The Queen of Erewhon"